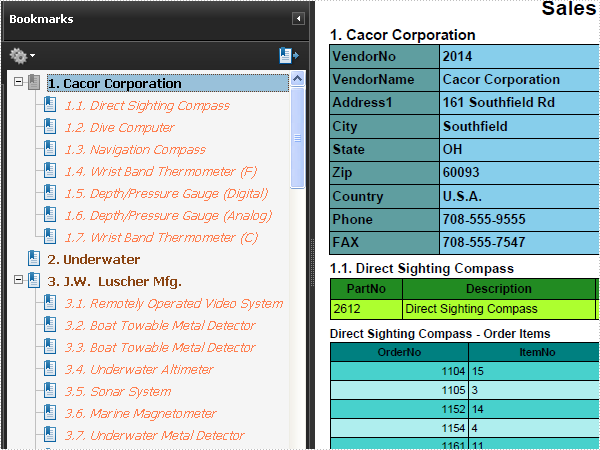 The sample demonstrates how to work with bookmark in PDF document. = " SELECT VendorNo, VendorName, Address1, City, State, Zip, Country, Phone, FAX "
= " SELECT PartNo, Description, OnHand, OnOrder, Cost, ListPrice "
= " SELECT OrderNo, ItemNo, Qty, Discount "
& " FROM vendors "
& " FROM parts WHERE VendorNo = @VendorNo"
& " FROM items WHERE PartNo = @PartNo"
Word bookmark is convenient for users to go to specified location and modify contents of bookmark range in a document. Solution in this guide introduces how to insert bookmark in existing Word document in C# and VB.NET via Spire.Doc for .NET. In this example, the bookmark range is from the end of the fourth paragraph to the end of the fifth paragraph. The following screenshot presents effect after Work bookmark inserting. 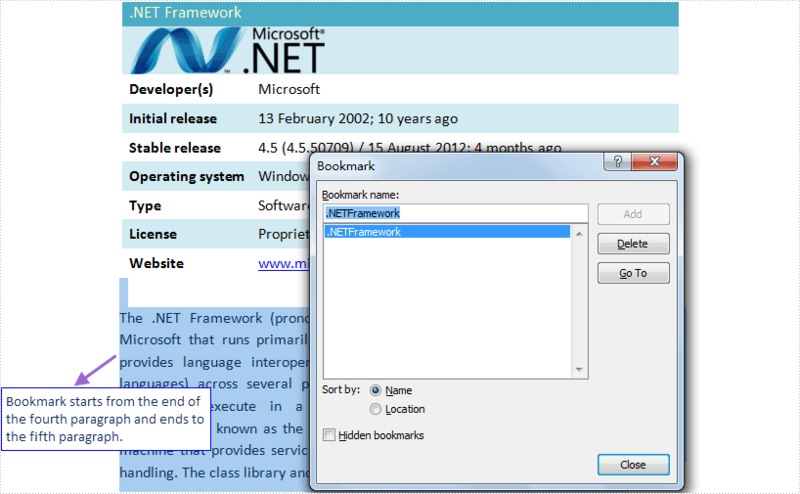 Spire.Doc for .NET, a professional .NET Word component, provides two methods to insert Word bookmark, Paragraph.AppendBookmarkStart and Paragraph.AppendBookmarkEnd with parameter string name. The former method is used to append start of the bookmark with specified name into paragraph, while the later to append end of bookmark. Download and install Spire.Doc for .NET and follow the code to insert Word bookmark. Spire.Doc, an easy-to-use component to operate Word document, allows developers to fast generate, write, edit and save Word (Word 97-2003, Word 2007, Word 2010) in C# and VB.NET for .NET, Silverlight and WPF. The sample demonstrates how to Set bookmark in Word document.